The perfect salad is a mixture of healthy & tasty. Why eat something that tastes awful? There's simply no need. No need at all. 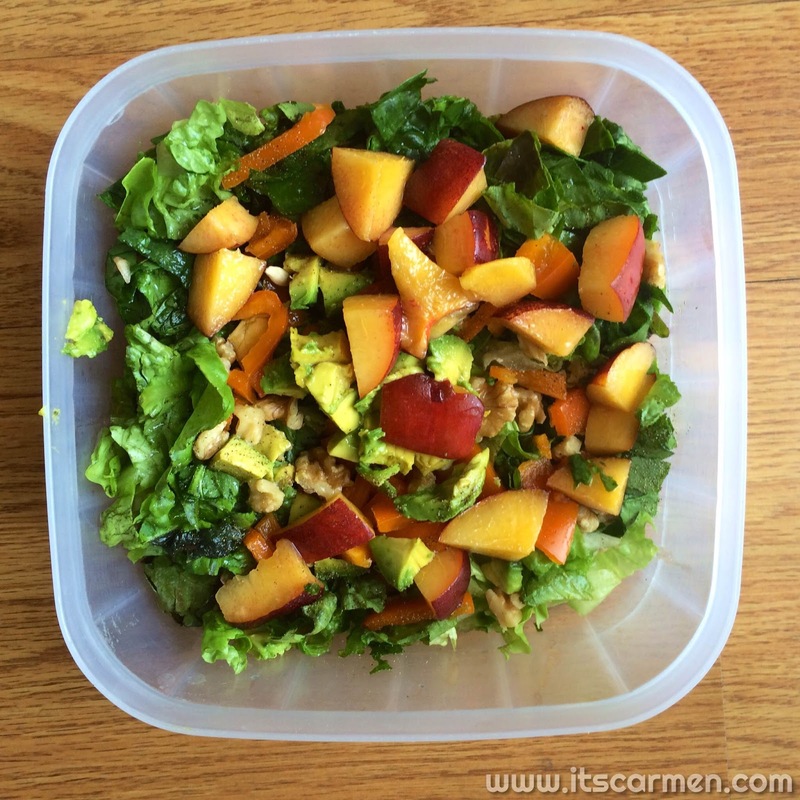 With this Nectarine Summer Salad you'll be salivating for more. It's not really a secret, but the "secret" ingredient is the ever so sweet nectarine. With this vegan salad you'll get flavor & crunch. The textures & tastes come together to create a heavenly combination. Wanna make it? Read on, my friend. Read on. **Diced vs. chopped means that diced are smaller, whereas chopped are bigger chunks. 1. Rinse your lettuce & spinach to get rid of any dirt. Dry them off a bit, then chop them coarsely. 2. 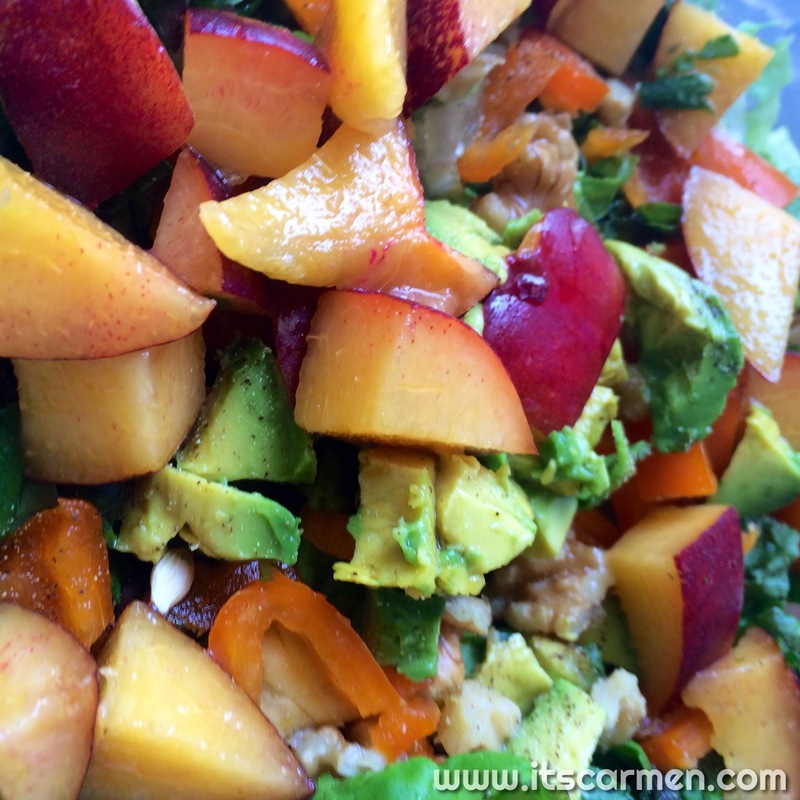 Dice your nectarine, avocado, & bell pepper. Toss them on top of your lettuce & spinach mixture. 3. Add some walnuts. You may leave them whole or crush them up. It's up to you. 4. Lightly drizzle your salad with some dressing. We didn't have any so I mixed lemon & pepper for a low key dressing. See? It's not difficult to make. My boyfriend ranted & raved about the addition of the nectarine. It gives just a touch of sweetness, which isn't all too common in salads. I like the combination of greens & fruit. This salad is filling with the avocado & walnuts. Avocado is a nutrient-dense food; they have over 20 vitamins & minerals! So you'll be energized to take on the rest of your day! Nom nom nom! this looks amazing! thank you for sharing the recipe. Yum! I'm going to have to try this now! I love salads and I love nectarines. Both together? I'm not sure as I know I'm not keen on grapes or apples in my salad. 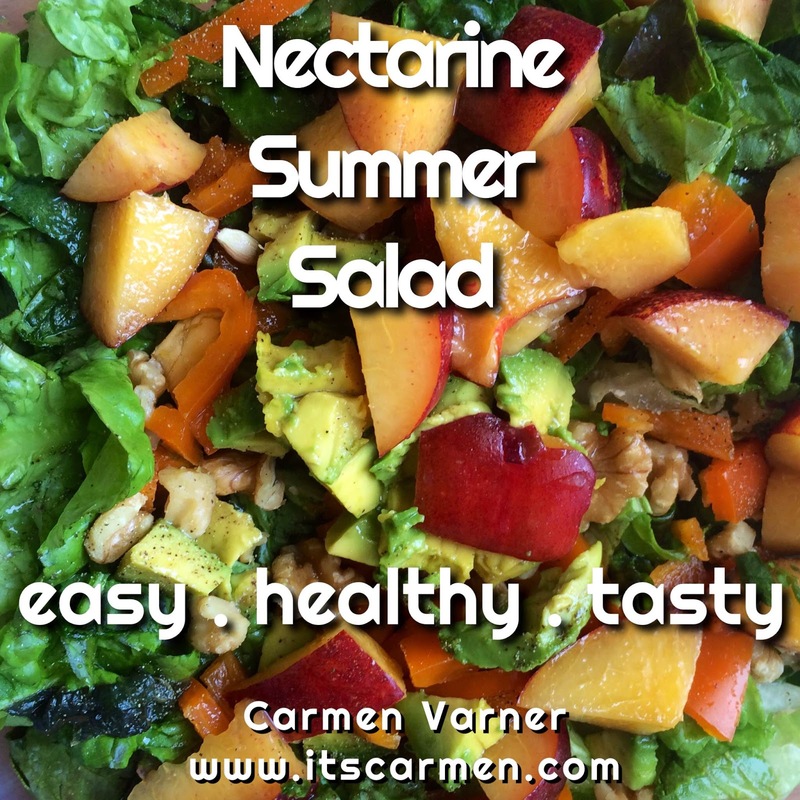 I have to say though in the Summer when its so hot maybe the nectarine will be a perfect addition in any salad. Thanks for visiting my blog! Awesome reciep, thanks for sharing!